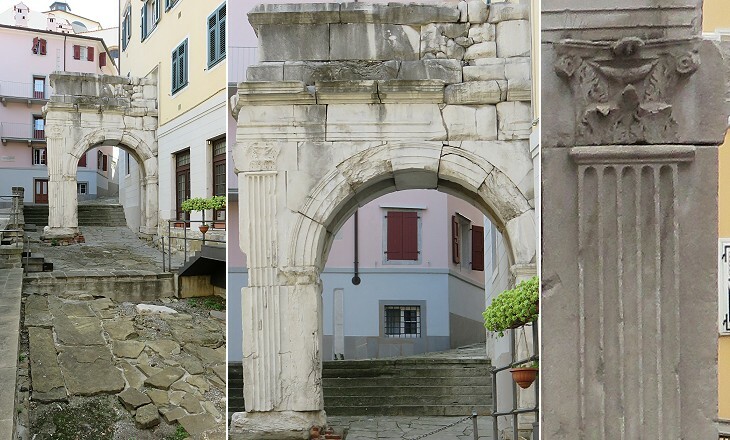 With the exception of the columns at S. Giusto there is but one other fragment of Roman Tergeste still standing, the 'Arco di Riccardo' as it is called, a Roman triumphal arch, half buried in the ground and spanning a narrow street of the old town that runs sharply down the hill-side. It owes its name to some legendary connection with our English Coeur-de-Lion. Sir Thomas Graham Jackson (1835-1924) was one of the leading architects of his time. He visited Trieste in 1885 and he wrote a very detailed account of Basilica di S. Giusto, its cathedral. At that time Trieste was part of the Austro-Hungarian Empire. The arch was most likely built by Emperor Augustus and it was the southern gate of the walls protecting the town. The reference to Riccardo perhaps derives from the arch being located at the end of cardo maximus, the main north-south street of the Roman town. 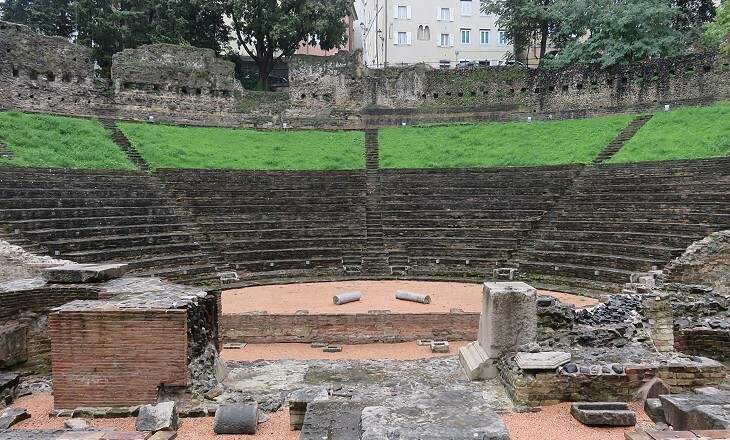 In 1938 some old buildings at the foot of the hill where the ancient town stood were pulled down to unearth a Roman theatre, the presence of which was already known. 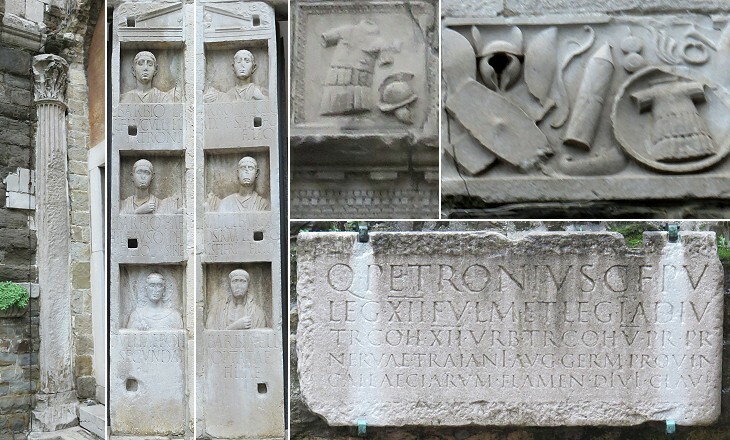 It was built at the time of Emperor Augustus and modified during that of Emperor Trajan. It was almost entirely built into the slope of the hill and it could house an audience of 5,000. Tergeste (the Latin name of Trieste) flourished during the Roman rule when a road linked it to Aquileia to the west and Parenzo and Pola to the south. Its harbour was of particular importance for sending reinforcements and supplies to the Roman legions in Pannonia, today's Slovenia and western Hungary. A road was opened to link Tergeste to the main road between Aquileia and Aemona (today's Ljubljana, the capital of Slovenia). 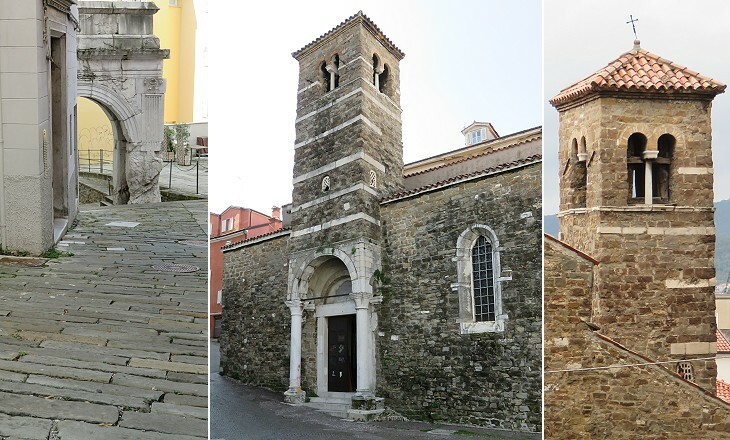 Trieste, similar to Venice, became a Byzantine possession in the VIth century. In 788 it was conquered by the armies of Charlemagne. In 948 the Bishop of Trieste was granted some rights over the administration of the town by Lothair II, (nominal) King of Italy. 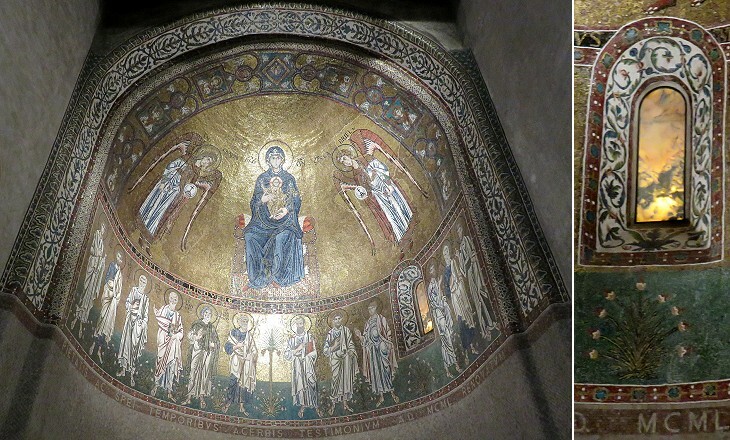 The Bishops of Trieste requested the help of the Patriarchs of Aquileia to retain their independence which was threatened by the Venetians and the town was often recorded as a possession of the Patriarchs. Towards the end of the XIIIth century the Bishops relinquished their authority to bodies elected by the wealthiest inhabitants of the town. 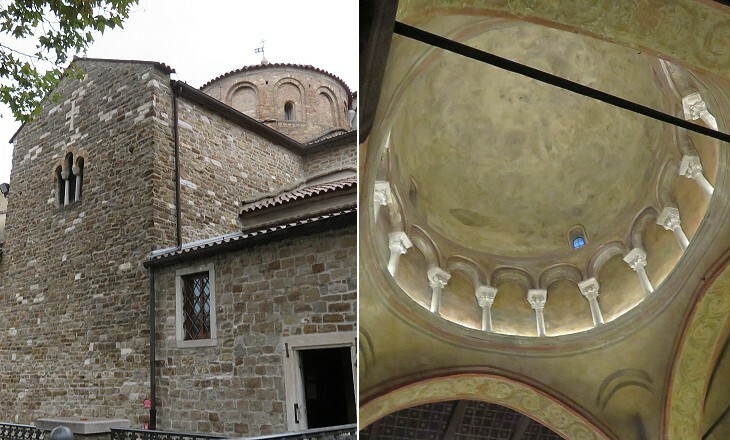 The façade is dated early XIVth century whereas the bell tower was completed by the end of that century. It was taller than it is today because in 1422 it was struck by a lightning bolt which caused its partial collapse. 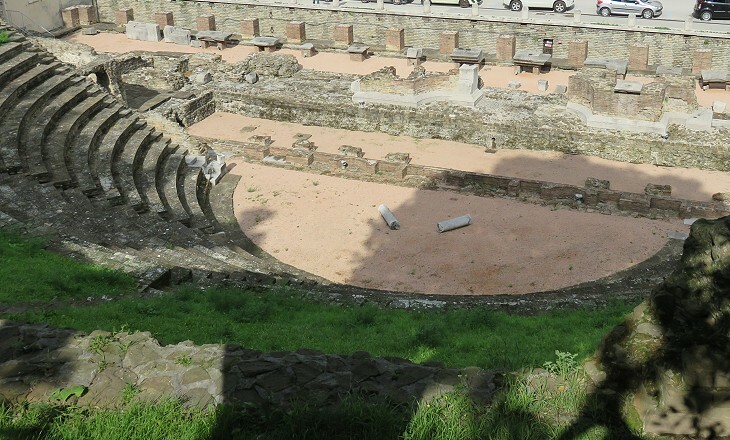 The location of a large Roman basilica has been identified to the north of S. Giusto. The image used as background for this page shows a relief of the Roman period portraying a battle between Greeks and Amazons at Civico Museo di Storia ed Arte. 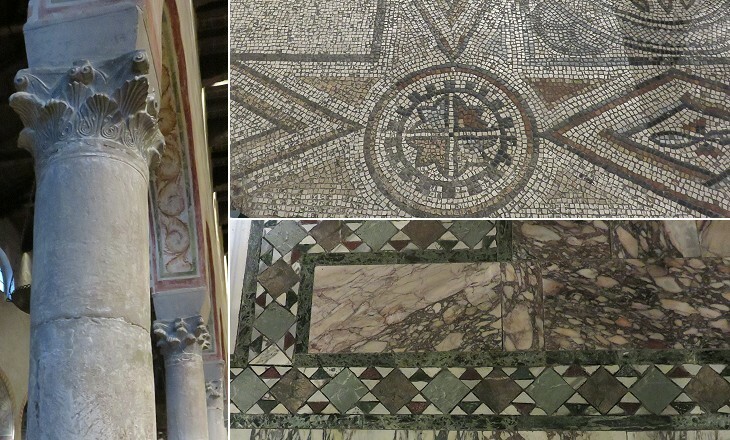 The slab was found upside down in the floor of S. Giusto. What may have been the object of placing two churches in such close juxtaposition is a curious question. 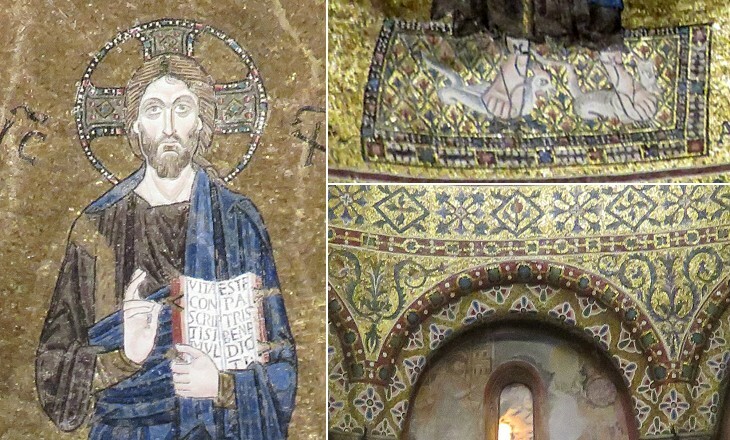 Dr. Kandler's theory is that the northern or basilican church was the cathedral, and the southern cruciform church the "confessio" or "martyrium" of Saints Servulus and Justus. (..) The two churches remained distinct till the fourteenth century, when the desire for a more splendid temple, or the wish to bring the bodies of the patron saints actually within the cathedral walls, or the fashion of multiplying altars, of which before the year 1000 one had sufficed in each church, or all these motives combined, occasioned the great change which brought the duomo to its present form. 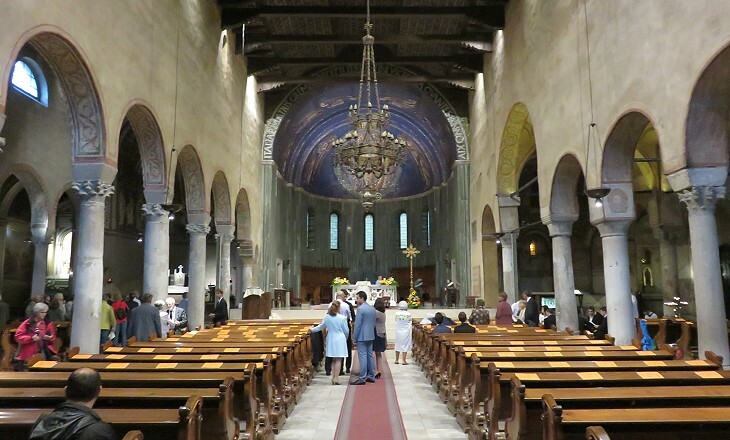 They threw down the walls of the two churches which were nearest one another, they prolonged the nave of S. Giusto with its aisle to the same length as that of the basilica, and they converted the space that was left between the two ancient naves into a principal nave, which being formed of sides that did not correspond, necessarily had to be irregular. 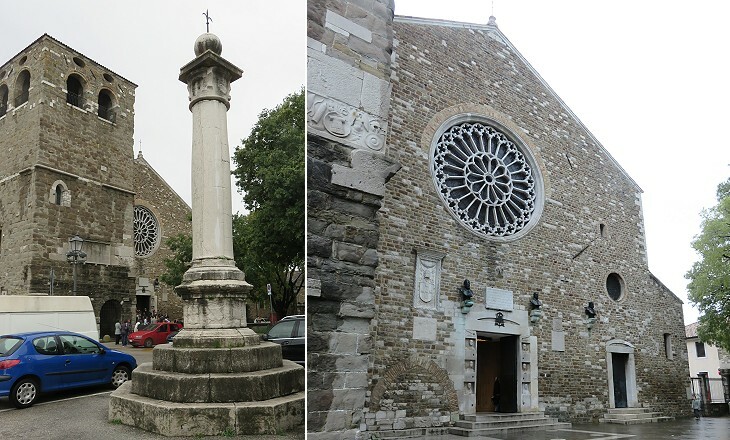 The new church was consecrated in 1385 at the end of a very turbulent period of the history of Trieste. In 1369 the town had to accept the suzerainty of Venice and in 1380 it was sacked by the Genoese during the War of Chioggia. In 1382 the inhabitants of Trieste requested the protection of the Dukes of Austria, thus establishing a link which lasted until 1918. 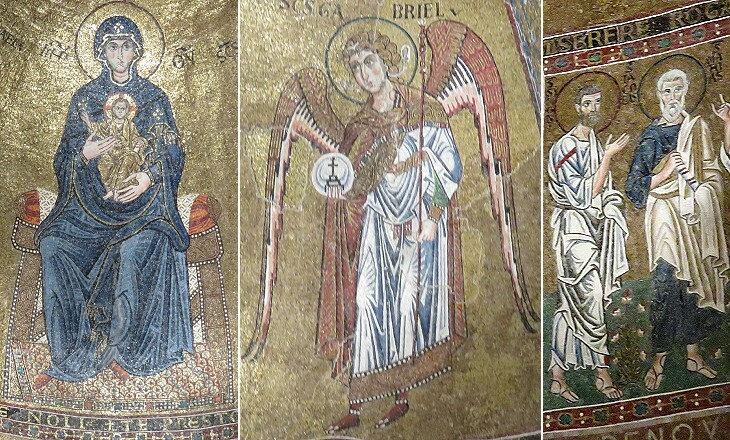 Today this mosaic is dated XIIth century. 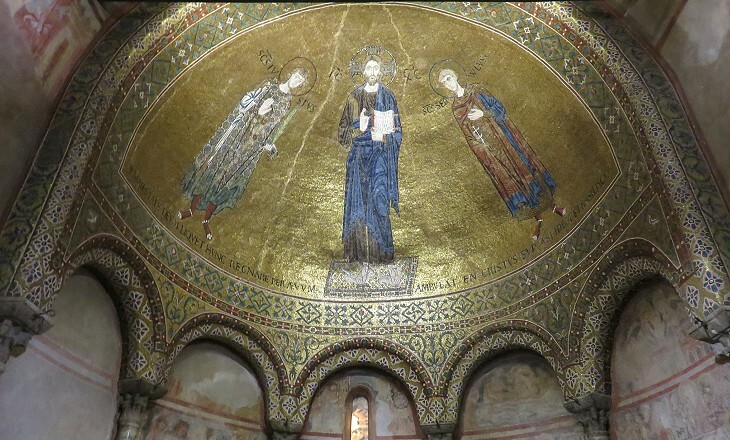 This mosaic is believed to have been made at a slightly later time in the early XIIIth century, most likely by Venetian experts.